In a two phase study on 20 patients, various theophllines were studied on three days in a random double blind manner. FVC, FEV1 and Raw were measured at 0, 2, 4, and 6 hours. In phase II: serial lung functions at 0, 1, 2, and 4 hours alone were done after anhydrous theophylline alone and in combination each with ephedrine, phenobarbitone and prednisolone or together. In phase I, anhydrous theophylline (A) was better by blood levels and aminophylline (C) next: the peak reached between 1.7 to 2.7 hours. For FVC and FEV1, first three (A, B, C) gave similar improvement with D, E were inferior. By Raw A and C preparations were better. The analyses for area under curve showed A to be superior. In phase II, the improvement with anhydrous theophylline was generally better and with other three drugs somewhat conflicting but inferior. Anhydrous theophylline seems to be the most useful of the theophylline preparations. 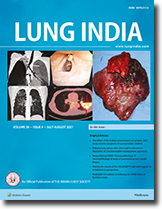 An open randomized trial of the newer quinolone, Pefloxacin was conducted in comparison with cotrimoxazole, in lung infections. Bacterial sensitivity and outcome in forty-four patients revealed the efficacy of the drug in lung infections. The results are analysed and presented. Single blind randomized comparison of the efficacy of cotrimoxazole and Pefloxacin messy-late was carried out on 88 patients with lower respiratory infections. Clinical improvement occurred n 95.6% and 88.4% of patients receiving contrimoxazole (C) and (P) respectively. Bacteriological eradication occurred in 65.5% and 86.3% in C and P groups (p<0.01). The results are discussed. Pefloxacin was administered to 35 patients with community acquired lower respiratory tract infections. Eight-six percent of patients responded well to therapy and there was cure of the condition and bacteriological clearance of pathogens including Klebsiella and Streptococcus pneumoniae. There was no superinfection or any adverse effect. There was excellent patient tolerance. The Treatment outcome was significantly better than that of cotrimoxazole. â€˜Pefloxacinâ€™, one of the newer 6-fluoroquinolones was found highly potent, in vitro against gram negative urinary pathogens. Out of a total of 135 strains of urinary pathogens tested in vitro against â€˜Pefloxacinâ€™, only six (4.4%) were found resistant. In an open trial 20 patients with serious infections produced by multiple drug resistant urinary pathogens were studied, divided into four groups. Group I consisted of four immunosuppressed renal transplant recipients. Group II had four immunocompromised subjects with renal failure and obstructive uropathy. Group III comprised of six subjects with acute renal failure and septicaemia. Group IV consisted of six cases of complicated urinary tract infection associated with miscellaneous conditions and immuno-compromised due to diabetes mellitus and/or renal failure. Good microbiological response and clinical cure were obtained in 90% and 85% of subjects respectively. The results are discussed. Ten patients received a combination chemotherapy consisting of Vincristine (2mg) Cisplatin (120 mg) and Bleomycin (30 mg) by slow infusion, repeated every three weeks. Additional radiotherapy in various dosages was given to eight patients. Nine patients responded. Median survival was 43 weeks with four patients surviving beyond one year. The side effects were tolerable. One hundred patients received ethambutol containing regimen for tuberculosis. Their serum zinc levels were monitored in comparison with controls. All the five who developed ocular toxicity had serum zinc levels of <40 mg%. Forty-nine who received zinc supplementation did not suffer toxicity. Besides malnutrition, low serum zinc levels could have contributed to ocular toxicity of ethambutol. A case of fatal cerebrovascular accident following metastatic extension of a pulmonary neoplasm into the cardiac ventricular lumen is reported. A case of giant lymph node hyperplasia presenting as a benign mediastinal mass in a 22 year old male is reported. The clinical and histological presentations are reviewed. Penetrating injuries of the chest commonly enter the thoracic cavity through intercostals space. Two cases where knife had penetrated the chest through a rib are reported. In the first case it was missed and intrathoracic exploration abandoned. This experience helped in proper exploration of the wound and thoracic cavity in the second case. An uncommon association of Eaton Lambert Syndrome with adenocarcinoma lung is reported. A four year old female child, who presented with clinical and radiological features of massive pleural effusion was found to have a huge hydatid cyst on ultrasound examination. Such a presentation is seen for the first time in this center which has a high incidence of hydatidosis. Problems of domiciliary management of tuberculosis in the community are many. The factors involved and possible remedial measures are analysed and presented.